I love the interaction between Yeon Seo and Shi-on as usual. Shi-on and Yeon Seo are alike in the way that they will risk all cost to save a patient life. 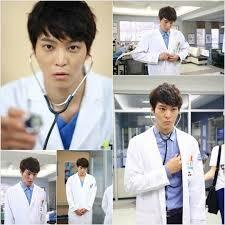 Shi-on is programme inside his brain to save the patient no matter what and Yeon Seo cannot turn a patient away. In the end both of them broke the rules and went ahead with the surgery. The other couple I ship is In Hye sister and Jin-Wook who looks compatible. Yeon Seo first attempt to save the little girl was met with obstacles. It was a tragic for the little girl who was refused by all the hospital. I can see in this drama, the team is committed and professional in the way they work. I wondered in real life, is there such a thing? Lastly, I don't understand why Do-Han love Chae-Kyung. I was mad at her for switching off his handphone. Chae Kyung gave me a bad impression, like a spoilt brat sort of way. She appears to be self-centered and refuse to admit her mistakes. Hopefully, she will change for the better in the next few episodes.